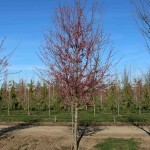 An upright, arching, vase shaped tree with single, rosy pink blooms in the spring. 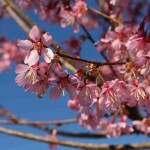 It is a hybrid of Prunus incisa and Prunus campanulta. The summer color is a dark green, the fall color is bronzy red to bright orange. The overall texture of this flowering cherry is delicate.